By mid-May, 1968, American ground troops had fought the Vietnam War for seven bloody years. The Communist’s Tet Offensive had been soundly defeated some four months previously and with that offensive had died the indigenous Viet Cong. The continuing inflow of North Vietnamese Army (NVA) troops was now even more crucial for the Communists’ pursuit of the war. The "Viet Cong" battalions were soon filled with these Northern-born conscripts, trained in conventional warfare and unfamiliar with the southern terrain in which they operated. The former guerrilla war essentially ceased. The huge North Vietnamese Army also continued in its attempts to invade its southern neighbor in its own 10,000-man division-sized units heavily armed with artillery and even tanks. The NVA had the luxury of operating from "neutral" Laos and Cambodia, and free from attack. To defend this 800-mile border, the American and South Vietnamese Army established a string of border outposts intended to signal the NVA presence and allow an American counter-attack once these enemy troops entered the South. Most American troops were required in the enormous logistic "tail" necessary to fight a war 10,000 miles from home. Comparatively few units were available for this mobile mission. These few were referred to as "maneuver battalions" because they were able to take the war to the enemy. In May, 1968 American casualties were running as high as 500 men killed in action in a week. The huge majority of these casualties, fully 80% of them, was being borne by that small handful of troops in the maneuver battalions. These battalions never numbered over fifty, with an average field strength of about 500 men each. Thus, while American peak strength in the war was almost 500,000 troops, 80% of the casualties were being suffered by the 25,000 men who fought in the maneuver battalions. Mark Woodruff's latest book takes you right into the fiery heart of one of the Corps' most vicious fights in northern I Corps. 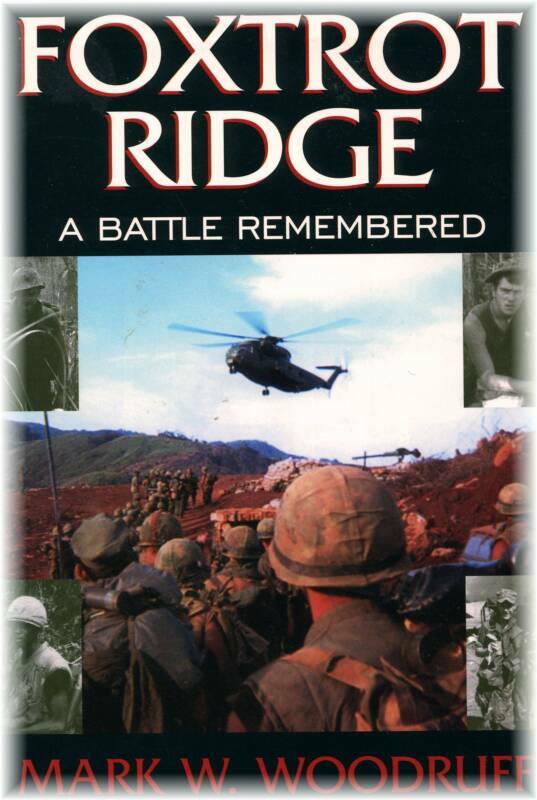 It's a gut-level look at the battle for Foxtrot Ridge replete with eyewitness accounts from the Marines who were there...including the author. Recommended reading for all who want to know the truth about the war in Vietnam and the men who fought it. One such maneuver battalion was the 2nd Battalion, 3rd Marine Regiment. This is the story of one of their battles, told by the veterans themselves. The battle began on May 28, 1968 when the 88 Marines of Foxtrot Company, 2nd Battalion, 3rd Marine Regiment were engaged by an NVA battalion of over 500 men near Khe Sanh. The resulting fight, has come to be known as the Battle of Foxtrot Ridge. The fighting, much of it in pre-dawn darkness was fierce and confusing. When it was over, the Marines had suffered 13 men killed and 44 wounded, killing 230 of the enemy during the nine-hour battle. We are very proud to offer Foxtrot Ridge. The book is a collection of first-person battle recollections from over 20 survivors of the battle, including the author, which tells the story of the battle in a very personal and poignant way. At times filled with the physical sights, sounds, and smells of battle, while at other times, overtaken by pure emotion, Foxtrot Ridge is a unique and powerful view of war. The battle of Foxtrot Ridge was not a "deciding" battle, it was not special or unique, and remains only a footnote in most histories of the war. Yet it was battles like this, fierce battles fought at the 100-man company level, that tell the real story of the American fighting man in Vietnam. Taken as a group the battles were the Vietnam War. Mark William Woodruff was born in Omaha, Nebraska, and is the author of the highly-regarded Vietnam history, Unheralded Victory (Vandamere Press, 2000). The author enlisted in the Marine Corps in July 1967; completed his Boot Camp at the Marine Corps Recruit Depot, San Diego; and took Infantry and Advanced Training at Camp Pendleton. He served in Vietnam with Foxtrot Company, 2nd Battalion, 3rd Marine Regiment from December 1967 to December 1968. After leaving the Marine Corps, he graduated from Pepperdine University (Los Angeles) in 1970 with a B.A. in Psychology, receiving his M.A. in Psychology from Pepperdine in 1971. In 1973 he moved to Australia and began a career as an Educational Psychologist in Western Australia. He holds a reserve commission with the Royal Australian Navy as a Psychology Officer and has also worked with the Australian Vietnam Veterans Counseling Service in Perth. Currently, he is a Senior Navy Psychologist at Fleet Base West in Western Australia.